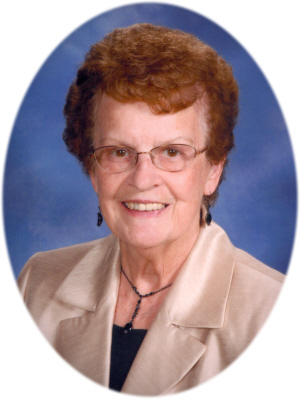 Louise Martha Feldpausch, loving wife, mother, grandmother and great grandmother, died suddenly on Sunday, March 17, 2019 just a few days short of her 85th birthday. Louise was born in Pewamo to William and Hildegard Schafer. She is survived by her husband and best friend, Francis Joseph Feldpausch who she married on June 19, 1954, at St. Joseph Catholic Church, Pewamo, MI. Louise is also survived by sons: Glen (Ellen), Patrick (Becky), and Ross Feldpausch; and daughters: Sue (Dave) Weber and Judy Garner. Left to carry on her legacy are twelve grandchildren and five great grandchildren with number six due soon. Also surviving is brother Ken Schafer and sister Diane (Carroll) Conroy. Preceding her in death are brothers: Bernard and Henry Schafer, as well as sister Patricia Howorth, and son-in-law Darrell Garner. Louise deeply loved her family, church, playing cards and was well known for her sewing and quilting skills. A Mass of Christian Burial will be held at Most Holy Trinity Catholic Church, Fowler, MI on Friday March 22, 2019 at 10:30 A.M., with Rev. Fr. Dennis Howard officiating. Visitation will be held on Thursday, March 21, 2019 from 2-4 P.M. and 6-8 P.M. at Smith Family Funeral Homes - Goerge Chapel, Fowler, with Rosary prayed at 7 P.M. at the funeral home. Burial will take place at Most Holy Trinity Cemetery, Fowler, MI. Memorials may be made to Society of St. Vincent DePaul, 1009 Old US 27, St. Johns, MI, 48879, PH 989-224-8852, or Shared Pregnancy, 503 North Walnut Street, Lansing, MI 48933, PH 517-484-1882. Online condolences can be sent to www.smithfamilyfuneralhomes.com. The family is being served by Smith Family Funeral Homes - Goerge Chapel, Fowler, MI.